The floating markets of Bangkok with their colorful produce on adorable wooden boats floating through the city’s canals, majorly impressed us. When I heard about entire floating villages in Cambodia, I knew we had to take a trip out to see it for ourselves. I mean, what can an entire floating village even look like, how does it even work? All I honestly expected was a gathering of scattered houses on stilts along the lake shore, close to water but on solid ground. 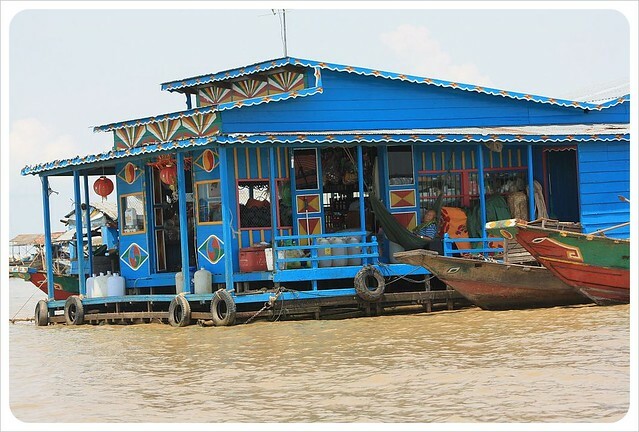 What we found instead was a thriving community on Lake Tonle Sap, a lake big enough to be mistaken for the ocean. It took a 20 minute boat ride sloshing through a small tributary to reach the village. 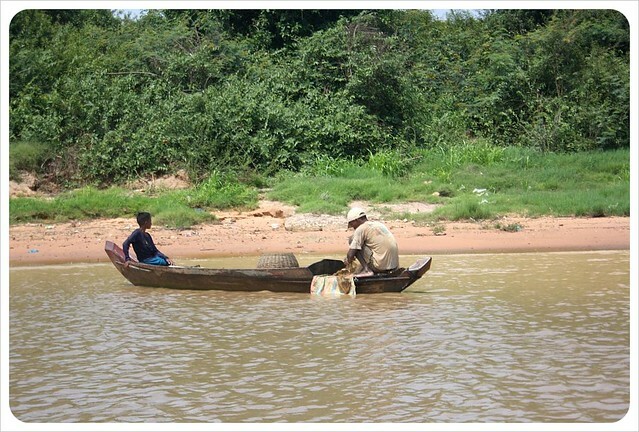 During the rainy season, the trip can take twice the time for the villagers to reach the dry land at the dock. 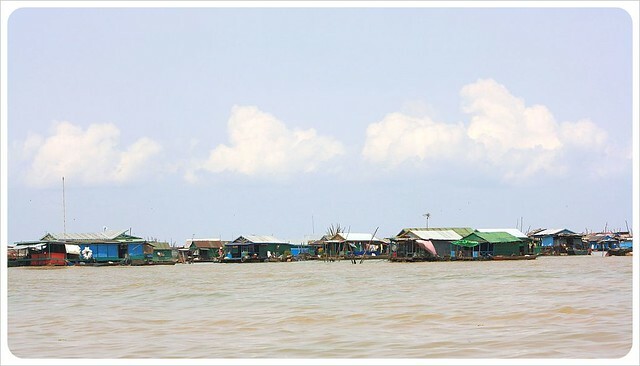 Most of Cambodia’s floating villages are based on Lake Tonle Sap. Though this is the largest freshwater lake in South East Asia, this unique body of water changes drastically in size throughout the year. In the rainy season between June and October, the lake is massive, flooded with water from the Mekong River. In the dry season, from November to May, the lake shrinks to such a degree that its flow reverses to deposit water back into the Mekong. 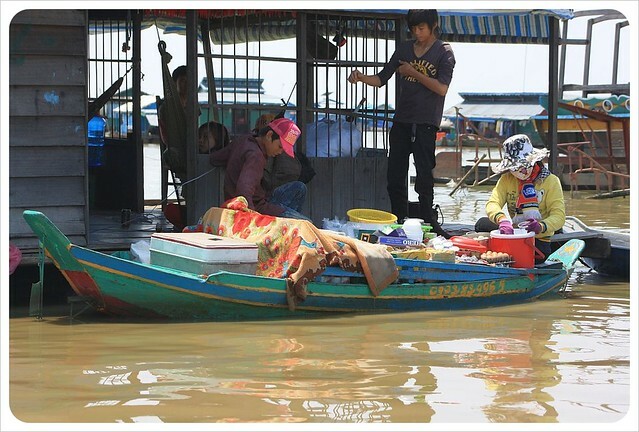 Tonle Sap is 16,000 square kilometers and nine meters deep during rainy season. In the dry season, that shrinks to 2,700 sq km and between 1 – 2 meters deep. 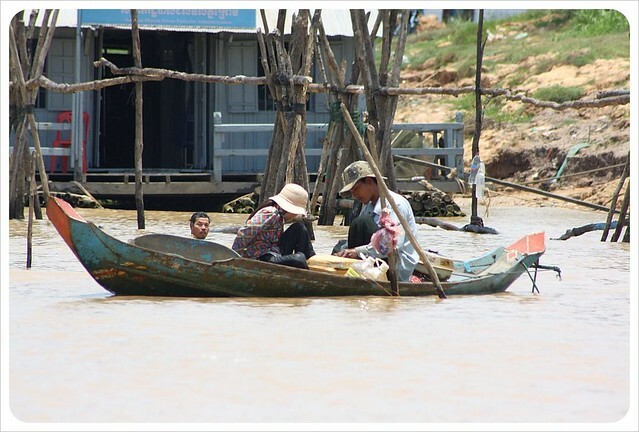 Because the water levels differ so drastically in dry and rainy season, fishing families who make their living on the lake began living in floating villages which move with the changing water levels. In the rainy season, this whole area is underwater. During dry season, these villagers live close to the shore. 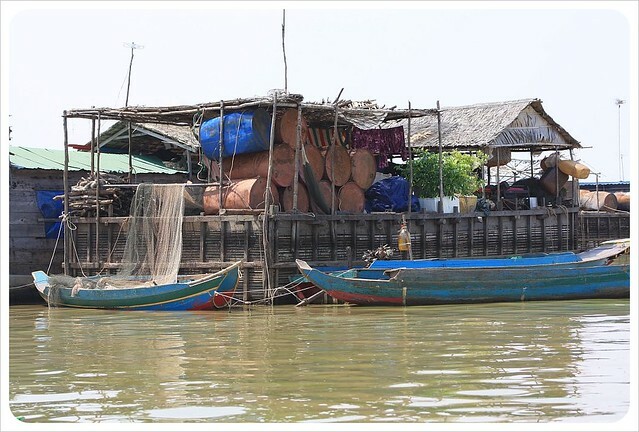 Tonle Sap is one of the world’s biggest inland fisheries, producing over 400,000 tons of fish and feeding over 3 million people. There are over 220 different species of fish in the lake! 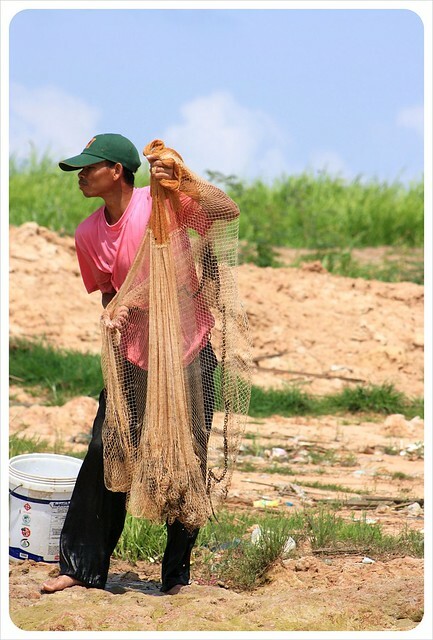 Providing over 3 million people with fresh fish means that fishermen are always in need. In total, 80,000 people live on the water permanently, spread out over 170 floating villages. 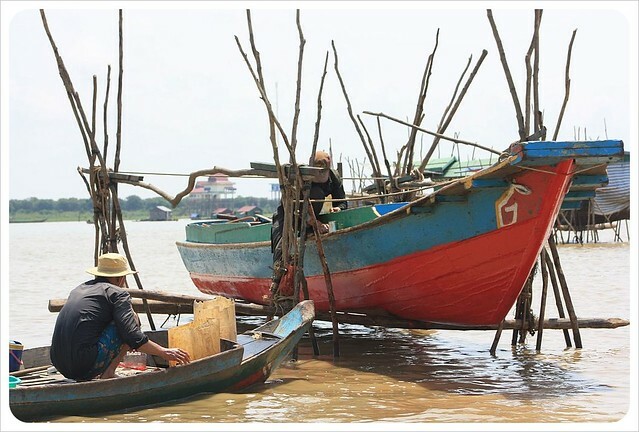 Unlike much of the Cambodian job opportunities, the income is also reliable, but life on the water is difficult. Fishermen sometimes travel two days to reach the middle of the lake and spend up to a week at a time out fishing. Large waves, limited food and dangerous conditions take their toll. The life expectancy of a fisherman is 54 years. Unfortunately it is fairly common for fishermen not to return from their week-long trips. 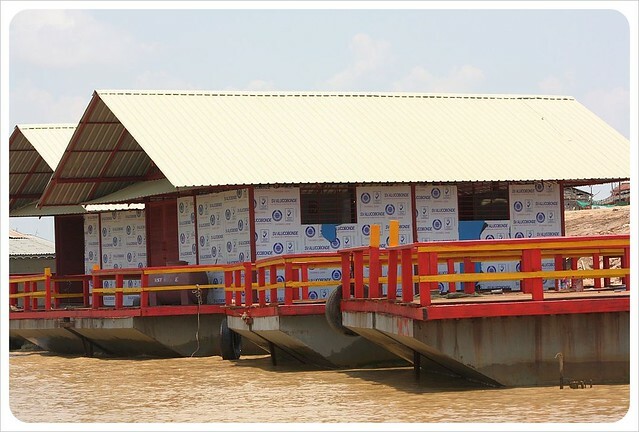 Many of the floating villages have their own floating orphanages to handle the many children whose parents do not survive. Life is hard on children, too. 12 per cent of the children die before the age of five due to the tough living conditions, the lack of medical care and ironically, malnourishment. Fish provides 65 per cent of protein in the Cambodian diet, but due to the lack of fresh fruit and vegetables, it is difficult to maintain a healthy diet. The annual income of households on the lake is under $500. The community we visited, Chong Khneas, was just about to open its first floating hospital (pictured below) at the time of our visit. 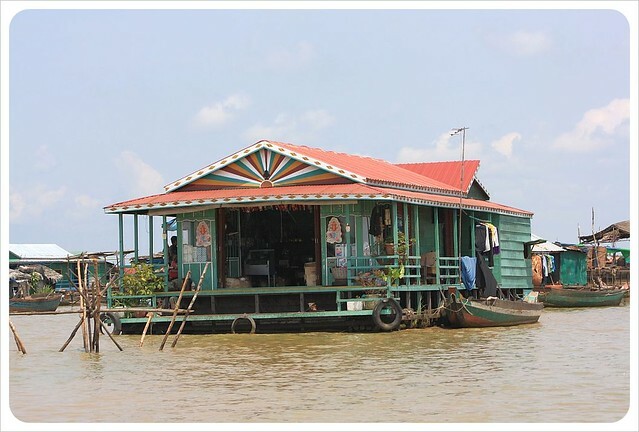 With seven villages and a total of 5,800 residents, this is one of the largest floating communities, so it makes sense that Chong Khneas be home to the first hospital. 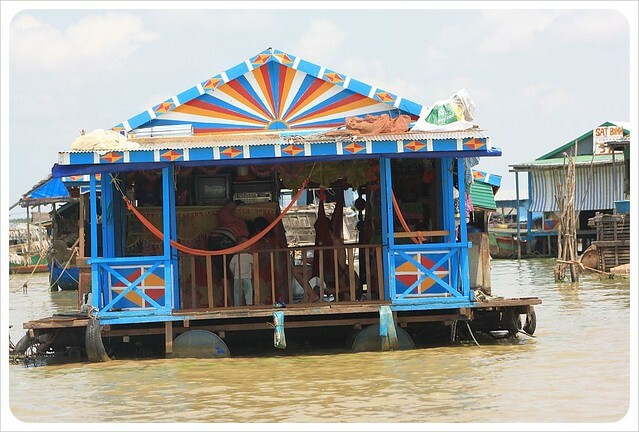 Life in a floating village means that every errand must be run by boat. Dropping the kids off at school or heading off to play basketball with their buddies must be done by paddling over by boat. And yes, there is a massive floating basketball court in the neighborhood! Most of the residents are self-sufficient, and it is incredible how they maintain their homes, with floating vegetable gardens and floating barns where they keep goats, pigs and chickens. And like everywhere in Cambodia, there are dogs out here on the water as well, though I am not sure how they feel about living on a floating house with no room to roam. At least it is much easier to find them if they run…or swim…away! There are also gas stations in the floating villages. Chong Khneas has three in fact, plus five schools, seven fish wholesalers, and for everyone’s entertainment: four karaoke bars. You might remember that karaoke is very popular in Cambodia. There are several floating supermarkets, but also floating markets like we had seen in Thailand: boats filled with fresh produce, and women paddling from house to house selling fruit and vegetables, wood and other things. 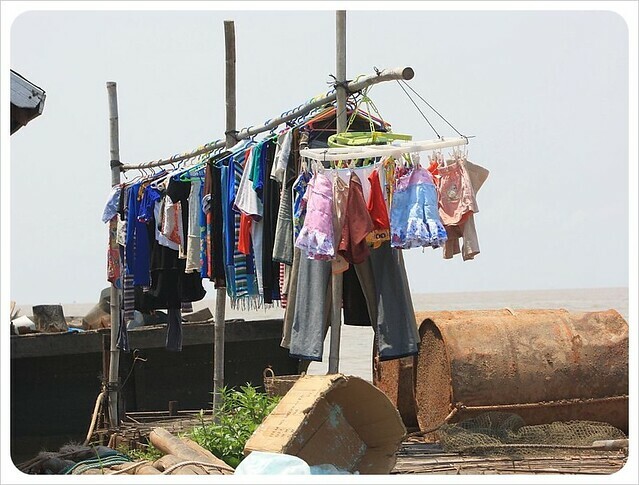 We are not sure how the villagers manage to dry their clothes in Cambodia’s already humid climate, but somehow it seems to work. Fishermen arrive at the closest fish market to sell their catch of the day. Happy faces… The kids are still enjoying themselves, but we couldn’t help but wonder how long they will stay that way, before following in their fathers’ footsteps. I was supposed to come here and check this out last December however forgo it for lack of time. I love the photos and the narratives, awesome! Hey, thanks so much. It was an interesting experience, but of course secondary to the reason most tourists are nearby – Angkor Wat! This is really fascinating to read. We visited a floating village in Vietnam (Halong Bay), but it was super touristy and we weren’t able to get any useful information from our tour guide. It looks like your experience was much more positive! It was definitely touristy, too, Christy! 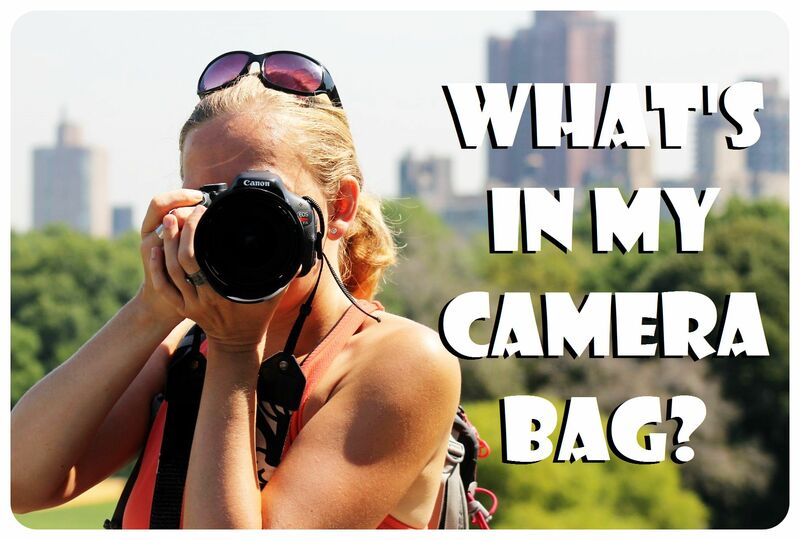 We tried to get off the beaten path, but were just really excited to see and experience it! Really interesting to read all the facts from the village. I took a boat through the lake on my way to Battambang but we didn’t stop at any of the villages except for one well past the lake and on the side of the river (just to pick up some lunch). 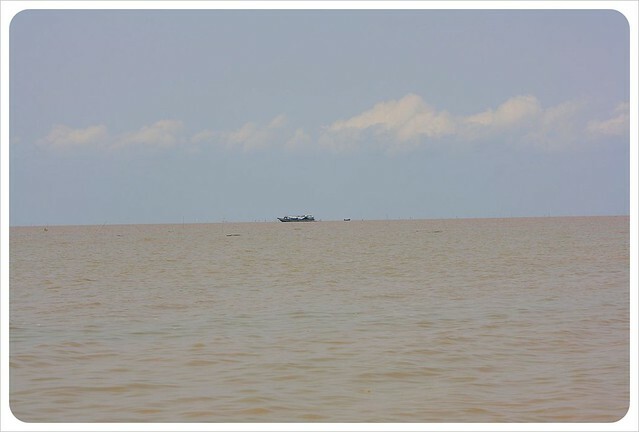 It was fascinating to pass through and the Tonle Sap lake was incredible. Thanks for putting together all the facts! Thanks Adam! We so wanted to take the boat from Battambang to Siem Reap but it didn’t work out – I heard it’s a beautiful ride! 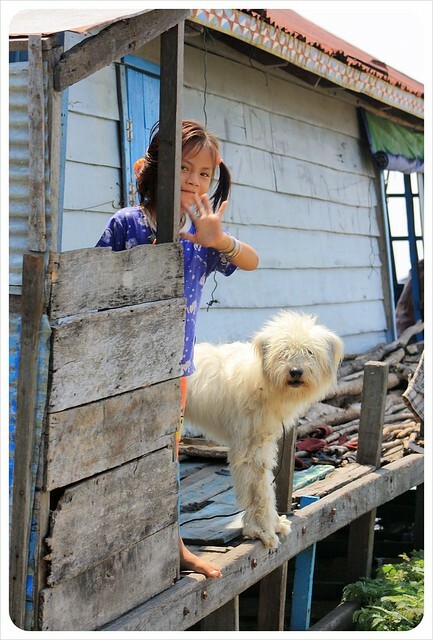 Thanks for this powerful and informative post…I know most of the touristy floating villages seem somewhat idyllic to foreigners passing thru. Myself, I haven’t visited any yet, but it definitely seems like quite an experience. I love the photo of the fisherman submerged in the water with a cigarette in his mouth. Pictures of locals have been some of my favourite pictures I’ve taken so far! Thanks, Laura! Well that place didn’t seem idyllic at all – it seemed like a really rough place to live in and I wouldn’t want to switch with them. But I guess the ones that tourists can visit are better maintained than the villages further off the tourist path. It was one of the most interesting trips that we’ve taken. What a facinating place. I was also wondering how they manage to dry their clothes! I am so surprised that the clothes dry in that humid air, but I guess the wind helps. It was fascinating to learn about life on the water – so many little details that you never think about! I find it very bizarre that a lot of people choose to live that kind of lifestyle. Although I admire them for being able to do so, I will never do that even for a million dollars. Well I think they go where the jobs are – in this case they are on the water. I am not sure how long I would last in a floating village! This is a really interesting read. It’s crazy that people live their whole lives in a more or less self-contained floating village. I would feel so claustrophobic. However, I love that they have four karaoke bars! It’s all about getting your priorities right! Thanks Arianwen. Isn’t it crazy to know that people live like this? I would be claustrophobic too, but I guess if you grow up that way you don’t know anything but that way of life. 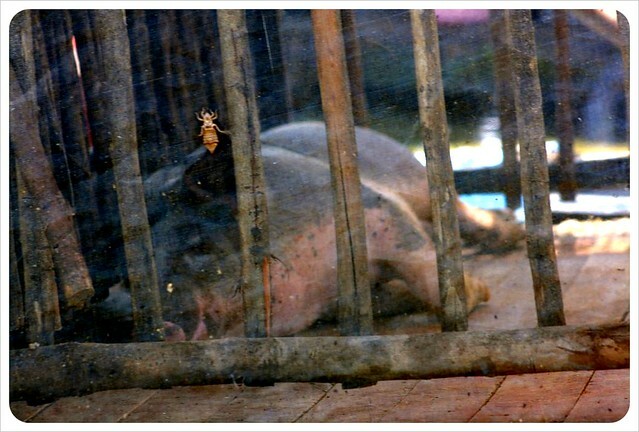 For them it must be shocking to go to a big city like Phnom Penh for the first time! #1 Fisherman in the water with cigarette photo… great photo. #2 Good read taking a closer look at how the village functions. Thanks, Stephanie! I loved how that guy was just smoking right there in the water. I think, it’s not expected for human life. Really it’s very harmful in my realization. Something need to do for them very soon. It’s very sad to me for their floating life. Think it, how much difference between peoples of earth! Wow! Floating villages. Never heard of any such concept before. Must have been an amazing experience to see all in person. It was an eye-opening experience, Arti! We learned so much about a way of life that was completely unknown to us. I can’t wait to go to Kashmir – we heard so many good things about it from people in India!! Wow, what a fascinating life! It’s definitely not an easy one but very different than anything most of us are used to. Orphanages, basketball courts, a lake that varies so much in size throughout the year – a very interesting story about life. I hope it’s one that the enjoy. As a kid, I am not sure I would like it as I would want room to run about and play. I love the floating villages of Cambodia. When I visited them the water levels seemed much lower than on your photos, so most houses were really high above us on their stilts. They even had a floating temple and police station. Fascinating lifestyle. Thanks Tammy! I think most of the houses in Chong Khneas were actually floating on big round aluminum jars, and they were pulled by boats further into the middle of the lake when the water levels sank. We only saw a few on stilts closer to the shore, but that’s how I thought all of them were! I am so amazed at the floating villages. How those people are able to do that, I don’t even have a clue because I don’t think I can ever do that. Me & water, we just happen not to be very good friends. Thanks, Laurence! I think for the kids it’s a lot of fun being by / in the water all the time – Cambodia is just so hot and jumping in the lake must be so refreshing. 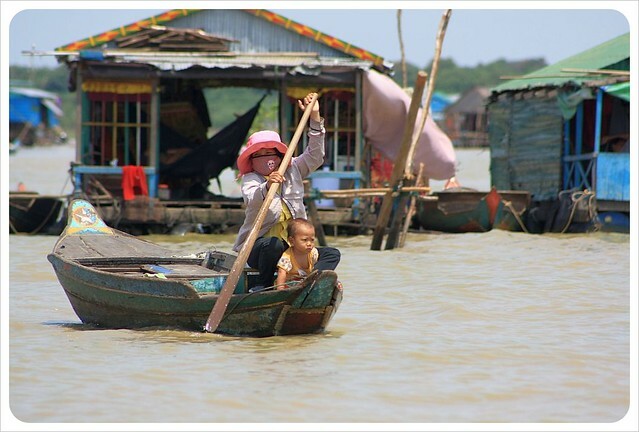 Glad to see life on the Tonle Sap is as fascinating as we remember it from many moons ago–wasn’t sure life on the water was for me then, still not sure if it’s for me now! I do enjoy time on the water from time to time, but I sure couldn’t live in a floating village 🙂 Tonle Sap is an amazing place though. Thanks for sharing that link, Cole – that is a HUGE floating village. wow!! Great photo essay, ladies– especially love that blue house! We visited a floating village very much like this on the Peruvian Amazon, but it didn’t look quite this nice. Like you said, it was amazing to see people with gardens, chickens, even livestock floating in the middle of the river, with people bathing, shopping, etc. on it and in it. Such an eye-opening view of a very different way of life. In Kashmir, there are these house boats called Shikara’s but a whole village is just unheard off, really! Nice picture story. I’d love to check out those karaoke bars! Yes, I think a visit to one of the karaoke bars would be fun! It’s so interesting to read some of the statistics about a place like this. When I saw the title, I expected a colourful and happy village in the water. It seems it can actually be quite a hard and sad life for a lot of them. Thanks for sharing! Yes, I think hearing about ‘floating village’ it sounds much more ‘romantic’ than what it actually is. I just know that I couldn’t live on the water! Just wondering. 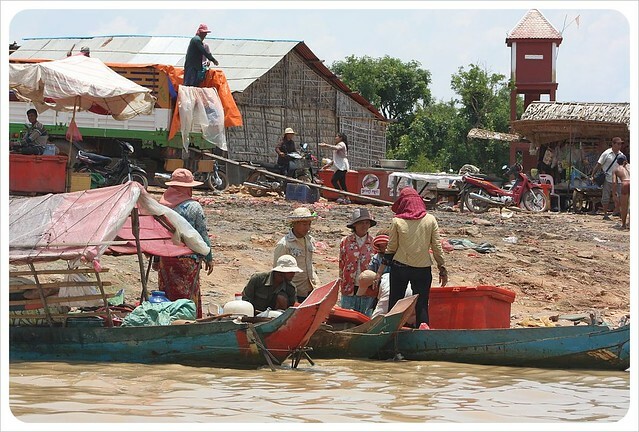 I heard that there are some scamming schemes playing on tourists’ sympathy on the Tonle Sap area. That some poor-looking children are well-trained to beg tourists to buy them overly-priced things such as bags of rice from some stores, which they’ll return to the stores again. There are a few other scenarios as well. I’m not sure to what extent this is true, but have heard many negative travel experiences and is currently considering whether I should drop this from my travel plan to Cambodia. Just wondering if you encountered any such experience here, and if there any tips? Hi Andrew, we haven’t actually come across anything like that while we were there. The experience was incredibly touristy though – not sure if you’ll enjoy it. While we were annoyed by how overpriced the boat rides were and how little we actually got to see of the floating islands, it was still a fascinating experience. Great narrative and photo’s. Visited Tonle Sap on a trip through Battambang, the lake was beautiful on the day with amazing reflections. One could see that it must be a hard life and the people just manage to make a living. Pretty sad really. Thanks so much! It’s such a hard life – I recently visited a floating village in Thailand which reminded me of the villages in Tonle Sap and all I admired the sea gypsies who lived in the Thai floating village for staying ‘afloat’ instead of simply moving to the mainland where they’d have a much easier life. Where are the toilets? Surely not just into the water. It seems to me they would get sick and spread disease. Bill – surely into the water, yep. 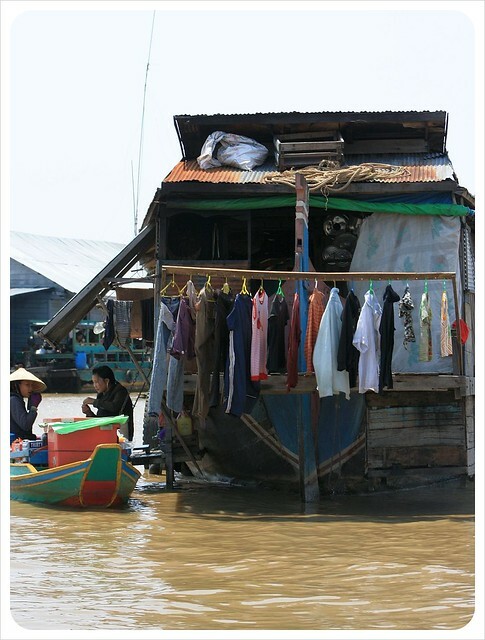 Considering that even a city like Venice still releases untreated sewage directly into the canals (not all buildings have septic tanks) it’s doubtful that a floating village in Cambodia will get a proper sewage system anytime soon. Which is why illnesses are widely spread and life expectation is low. WHERE does the WATER FROM toilets go ??? To the Lake goes the dirty WATER and THEN they get the fish FROM THERE ??? I really likeTO KNOW HOW THAT WORKS !! !